Anibild® TWO – An intermediate armature kit unlocks endless possibilities. 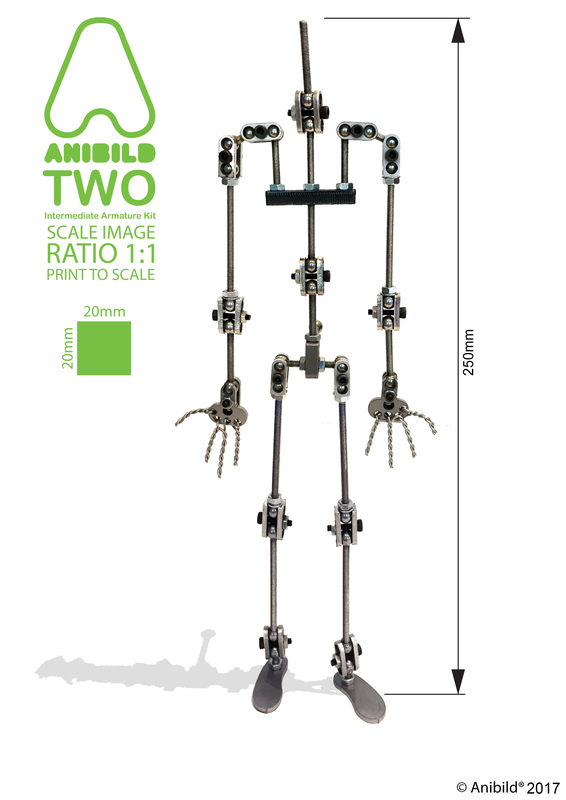 Anibild® TWO is a precision-engineered armature to deliver maximum effect required by intermediate level animators. The kit contains stainless steel joints with hardened stainless steel balls and socket head screws to make a humanoid armature. The joints are compact, strong and robust lending themselves to short film and collage students. Anibild® TWO also contains a rigging point for your character, which is fully integrated with the Anibild® Professional Rig system to support and execute technical and dynamic animation moves with your puppet. Anibild® will also require basic hand tools to put together (not supplied). Please note that you will need Locite threadlock glue to make a permanent fixing off balls to threaded rod (not included) available to purchase here.